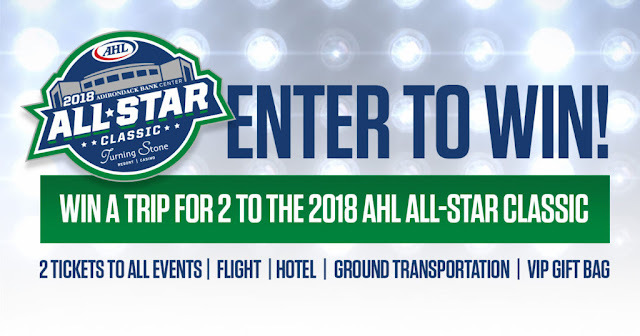 The American Hockey League is giving one lucky hockey fan a trip for two to the 2018 AHL All-Star Classic presented by Turning Stone Resort Casino! One (1) Grand Prize Winner will receive two (2) tickets to the 2018 AHL All-Star Classic Skills Competition, 2018 AHL All-Star Challenge and 2018 AHL Hall of Fame Induction and Awards Ceremony. Air or ground transportation to Utica, NY. If the Grand Prize Winner receives flights, those flights will arrive at Syracuse International Airport and ground transportation will be provided to all event locations. In addition, the Grand Prize winner will receive 2 nights of hotel accommodations at Turning Stone Resort Casino in Verona, NY and one VIP gift bag. The approximate retail value (ARV) of the Grand Prize is One Thousand Five Hundred Dollars ($1,500).